Express your gratitude with spring thank you cards. 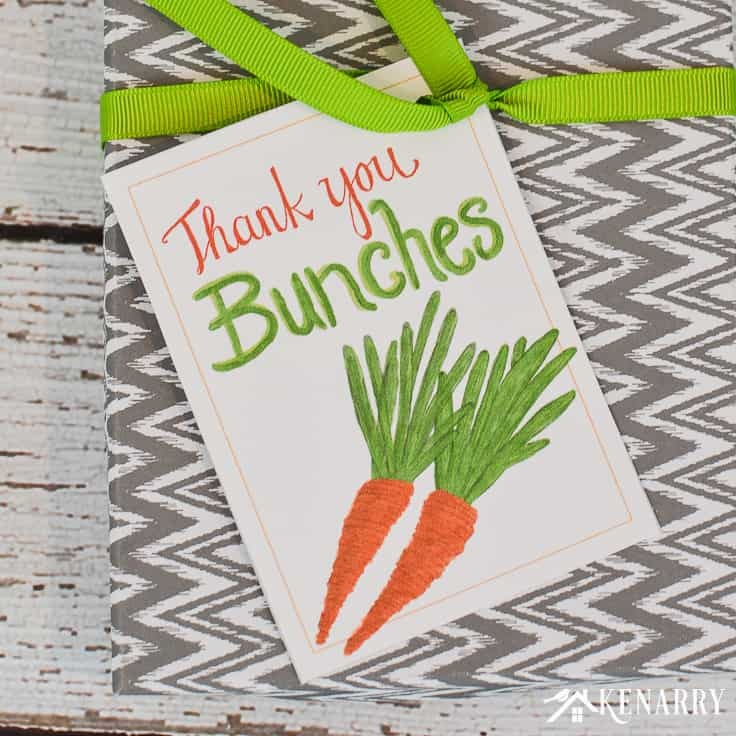 These free printable tags feature carrots and a note to say thank you bunches! Hey there! Today, we’re sharing some fun new spring thank you cards. 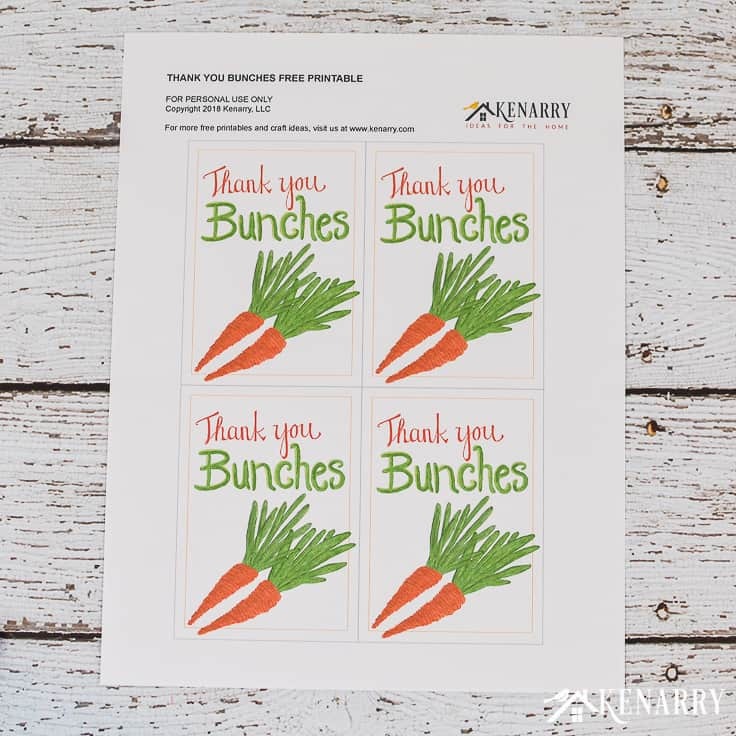 These free printable tags show hand drawn carrots and include a sweet note to say thank you bunches. 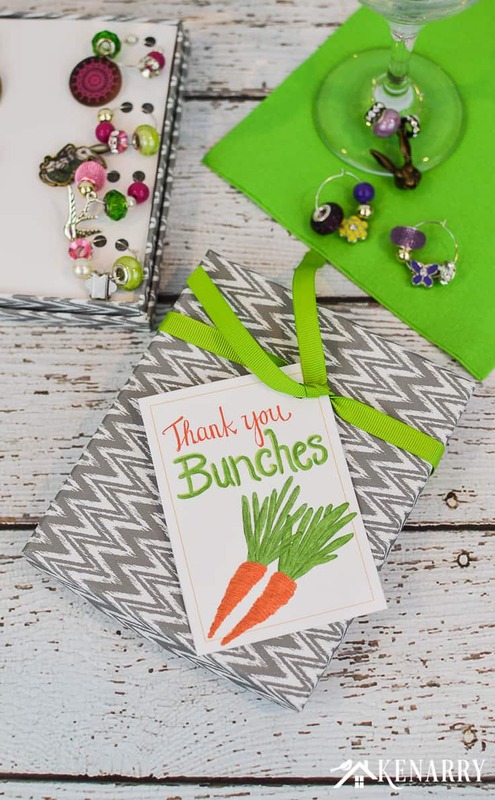 They’re perfect to use for Easter, Mother’s Day, teacher appreciation and more! Several weeks ago, I shared the Easter wine charms I made as a DIY gift for my Aunt Ronda and my cousin, Jessica. When I finished making the wine charms, I put them in a special little box tied with ribbon and a cute little note card. With Easter coming up this weekend, I wanted to follow-up today and share those cute little cards as a free printable for our Kenarry Idea Insiders. I thought you might like to use the tags for an appreciation gift this spring. 1. 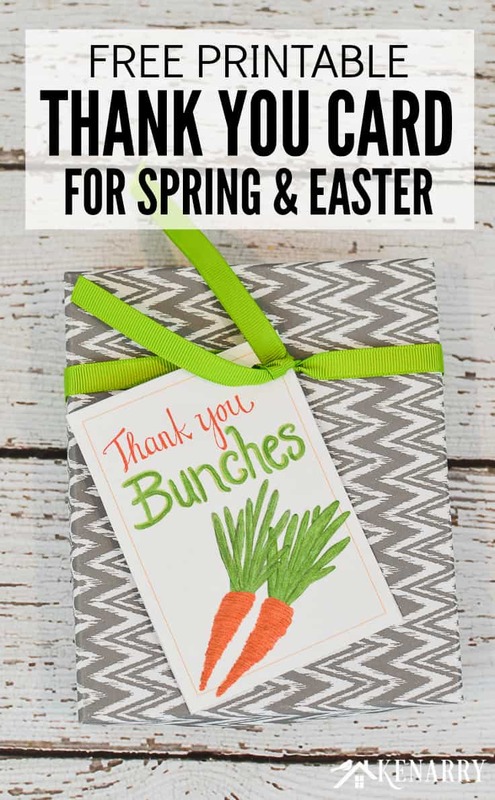 Get the free printable Spring Thank You Cards. The printable Spring Thank You Cards are available as a FREE gift when you sign up below! 2. Cut the Spring Thank You Cards apart. Cut the Spring Thank You Cards apart. For straight lines, it’s often really helpful to use a paper trimmer, but scissors will work great too. 3. Attach the Spring Thank You Cards to your gift. Use a hole punch to put a small hole in the upper left corner of the thank you tags. Then string ribbon through the hole and tie it around the top of your box or gift bag. Tie them around the top of hanging baskets or a large outdoor planter to give your mom for Mother’s Day. Attach them to packets of carrot seeds to use as wedding or bridal shower favors. 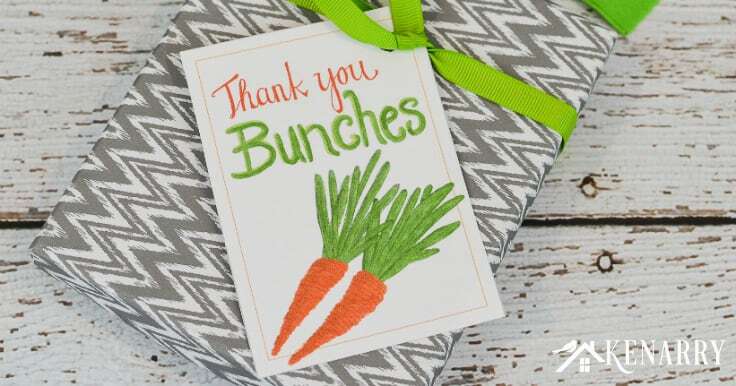 Glue the design to the front of a green or orange envelope and insert a gift card to a local lawn and garden center for Teacher Appreciation Week or to give to a teacher at the end of the school year. Wrap it with twine around a small potted plant or a bunch of flowers to give to volunteers at your school or nonprofit organization. Tape it to the top of a meal you bring to a friend or neighbor to express your thanks for some act of kindness they did to help you out! Carrots can also be thought of as a harvest vegetable so you could even use these tags in the fall. Wouldn’t they be cute as place cards on a Thanksgiving table? 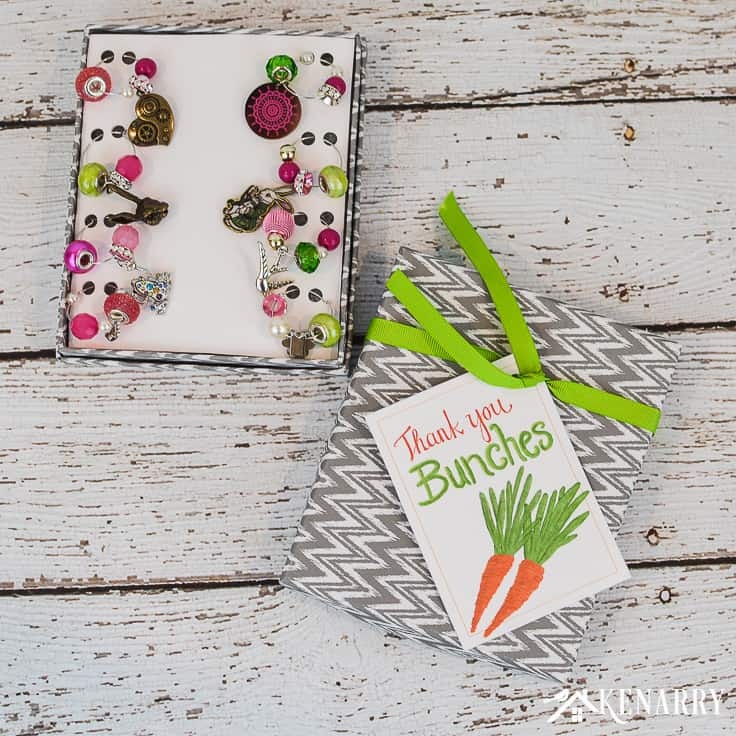 How else would you use these spring thank you cards or tags? Please comment below and share. We’re always looking for new ideas!